It turns out that instead of popping and hopping, I should have been rowing instead. Yes, you heard me -- rowing... Or didn't you hear,. I don't know about most of you, but there is something about New Yorkers that we just assume the exercise of popping out of bed in the morning and preparing to deal with our daily stresses is more than cardio enough. Then when we tack on our usual routine of hopping on the treadmill, elliptical or bike, we pat ourselves on the back for a job well done and keep it moving. However, as I continue on my adventure of becoming Fit and Fabulous, I've discovered my go-to routine for burning calories and relieving stress may perhaps be a bit antiquated. It turns out that instead of popping and hopping, I should have been rowing instead. Yes, you heard me -- rowing... Or didn't you hear, rowing is the New Black. A few weeks ago as I was walking through Central Park, I came across a long line at the romantic Boathouse where one can rent a canoe or take a long gondola ride through the man-made lakes and canals around the picturesque park. But I also noticed most of the people on this never ending queue weren't really dressed like tourists or sweet couples off for a whimsical ride. Instead they were dressed in proper athletic and rowing gear, as if they were ready to compete in some major yet unheard of event. But there was no scheduled competition. Instead these folks were in line to get their burn on. Now as much as I love Central Park, I'm like most other working stiffs (wink-wink), and don't have time to frolic about Golden Pond in order to achieve a maximum cardio burn. Therefore I found myself in search of something sans long lines, much more efficient and a great deal chicer. And like a message from the heavens, as well as further proof that Mister GoLightly was once again on trend, the other day as I walked through Equinox I noticed they were promoting a new rowing class dubbed the ShockWave. At first I thought to myself, "ShockWave -- this might be a bit too intense for my precious body to take." But it turns out Equinox's fitness advisor Jay Blahnik (I wonder if he is any relation to Manolo -- but I digress), has created this class along with world champion rower and ultra-endurance athlete, Josh Crosby. According to the professionals, "this new class is giving the rowing machine the Cinderalla moment it truly deserves." Via 30 and 45 minute circuit-style cardio and strength sessions in the coveted group fitness setting they are decidedly putting the rower front and center in a team environment. Members are broken up into groups and placed at either the rowing or one of three strength stations. 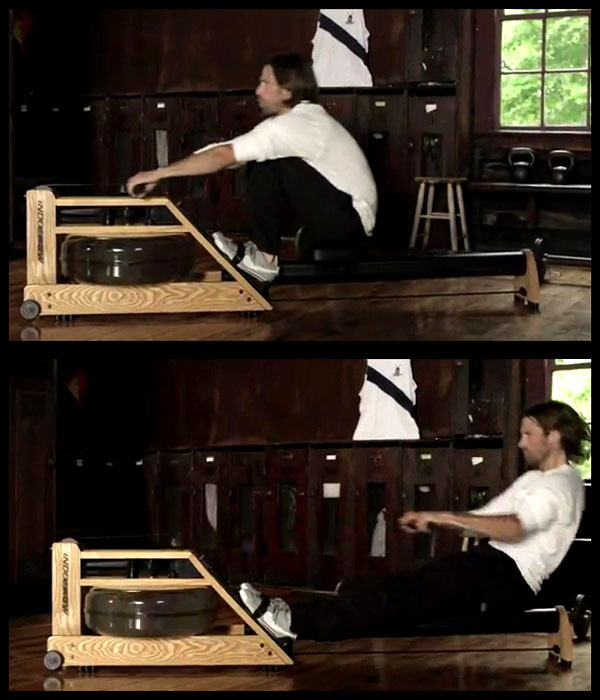 No one is allowed to rotate until each rower completes his or her programmed distance on the new, chic wooden-framed Indo-Row machines, which actually use water as the rower's resistance. According to the creators of the Shockwave class, "Rowing uses 80 percent of your muscle mass and recruits nine major muscle groups, so you are going to get the most for your minutes," says Blahnik, "It's the densest form of cardio you can do." That is, if you do it right. 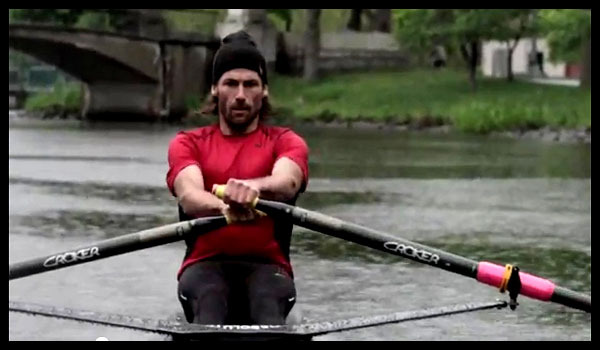 "Order is extremely important: Think legs, core, arms on the way out, and arms, core, legs on the way back in," says Crosby of the proper rowing technique, "About 60 percent of your power should come from your legs, 20 percent from your core and 20 percent from your arms." The more I watched the video of Josh Crosby rowing around the Charles River in Boston and understood how many calories I could seriously burn in a shorter period of time with this new class, I couldn't help but feel a little sorry for those folks continuing to wait on long lines around the Boathouse as well as other parks around the country. Something tells me I will eventually have the same sense of sorrow as I pass the folks in the gym still stuck in their daily routine of treadmills and elliptical machines. But now that rowing has officially been declared the New Black by Mister GoLightly, hopefully others will join in on the Fit and Fabulous adventure.